Why do investors engage in credit default swap (CDS) trading? At first glance, you would assume that the main motive is to obtain protection against default risk. But of course, a CDS is a bilateral contract: for every protection buyer (who purchases insurance against the underlying reference entity’s default), there must be a protection seller. The protection seller’s motive cannot be to obtain protection – she effectively increases her risk exposure against the underlying. So, are protection sellers speculators? Do they take on credit risk to diversify their pre-existing risk exposures? Or are there other CDS trading motives? In their 2017 paper “The Anatomy of the CDS Market” published in the Review of Financial Studies, Oehmke and Zawadowski tackle the question of CDS trading motives. To do so, they relate properties of the underlying reference entity to trading activity in a specific CDS contract. They measure trading activity at the weekly level via two publicly available proxies: net notional amount outstanding and market risk transfer activity (how much net protection was bought/sold). Both statistics are published weekly by the Depository Trust and Clearing Corporation (DTCC). Oehmke and Zawadoski identify four main drivers of CDS trading activity: hedging, speculation, trading frictions in the underlying bond market, and arbitrage. How do they provide evidence for these CDS trading motives? The more debt (bonds, loans, accounts payable) a firm has, the higher is the CDS trading activity. This is sensible: with a higher exposure of the market to the firm’s default risk comes more need to hedge this exposure. 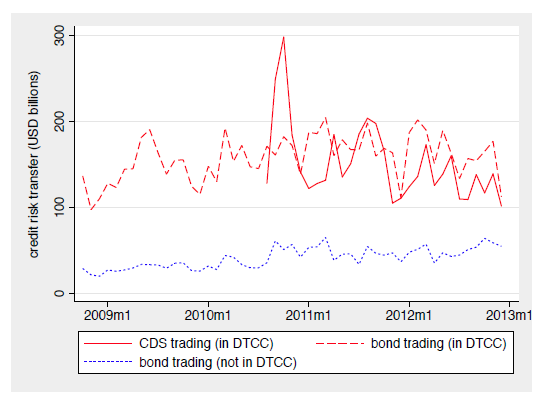 Figure 1 shows the comovement between corporate debt trading volume and CDS trading volume. To measure the extent of arbitrage opportunities, Oehmke and Zawadowski analyze the the CDS-bond basis. The basis equals the CDS spread (s) minus the bond yield in excess of the risk-free rate (ys). Simply put, the basis should be zero because if you buy a bond and protection via a CDS, you have eliminated the underlying’s default risk. If the basis is negative, you can buy protection at the spread (-s), earn the bond yield spread (+ys), and realize a positive risk-free profit (-s+ys). In line with this intuition, Oehmke and Zawadoski show that a negative CDS-bond basis positively affects CDS trading volume. In summary, Oehmke and Zawadowski’s results highlight the benefits of CDS markets. Yes, investors use CDS to speculate, but also for hedging. If we shut down CDS markets, bond investors could not hedge. Consequently, they would hold fewer risky bonds, increasing cost-of-capital for firms and leading to fire-sales of bonds in case of an immediate credit risk deterioration. In conclusion, the CDS market is important for the functioning of financial markets.